Standing close to the magnificent Taj Mahal, the Mayur Tourist Complex in Agra is a 'home away from home' for tourists visiting Agra for a Taj Mahal or business tour. The hotel Mayur Tourist Complex Agra is a fine hotel that provides tourists fine hospitality and personalized service. The Hotel Mayur offers a wide variety of rooms including single rooms, double rooms and suites with the in-room amenities including attached bathrooms, round the clock running hot & cold water, color TV, telephone and 24 hours room service. Mayur Tourist Complex has 30 A/C rooms. Some other facilities at the hotel include doctor on call, travel counter, safe deposit and laundry services. You can enjoy Indian, Chinese and Continental cuisines served at the multi-cuisine restaurant of the hotel Mayur Tourist Complex Agra. The bar at Mayur Tourist Complex Agra serves choicest of wines. 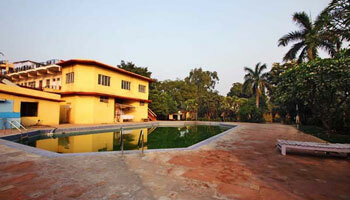 The hotel Mayur Tourist Complex has a swimming pool. You can also head on a shopping and sightseeing tour during your stay in Agra. Business and Conference Facilities at the Mayur Tourist Complex The government approved Mayur Tourist Complex in Agra, Uttar Pradesh, India offers state-of-the-art conference and banquet facilities. What do you think about Hotel Mayur Tourist Complex Agra? Be the first one to write reviews about Hotel Mayur Agra.